Dimensions 6.20 by 9.30 by 0.60 in. 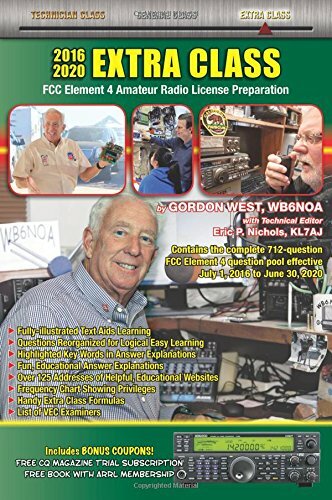 Amazon.com description: Product Description: Gordon West, WB6NOA, study manual for the 2016-2020 FCC Element 4 written examination for the Amateur Extra Class ham radio license. Book contains all 712 questions and answers, along with Gordo's educational, fun answer explanations. Contributing Technical Editor Eric P. Nichols, KL7AJ, adds his insight into complex topics adding to the student s understanding of difficult topics. Fully-illustrated with color photos throughout to aid learning. Q&A are reorganized into logical topic groups to make learning easier and fun.